Winner of the 2007 Otto Kinkeldey Award from the American Musicological Society and the 2007 Deems Taylor Award from the American Society of Composers, Authors, and Publishers. Divas and Scholars is a dazzling and beguiling account of how opera comes to the stage, filled with Philip Gossett's personal experiences of triumphant--and even failed--performances and suffused with his towering and tonic passion for music. Writing as a fan, a musician, and a scholar, Gossett, the world's leading authority on the performance of Italian opera, brings colorfully to life the problems, and occasionally the scandals, that attend the production of some of our most favorite operas. Gossett begins by tracing the social history of nineteenth-century Italian theaters in order to explain the nature of the musical scores from which performers have long worked. He then illuminates the often hidden but crucial negotiations opera scholars and opera conductors and performers: What does it mean to talk about performing from a critical edition? How does one determine what music to perform when multiple versions of an opera exist? What are the implications of omitting passages from an opera in a performance? In addition to vexing questions such as these, Gossett also tackles issues of ornamentation and transposition in vocal style, the matters of translation and adaptation, and even aspects of stage direction and set design. Throughout this extensive and passionate work, Gossett enlivens his history with reports from his own experiences with major opera companies at venues ranging from the Metropolitan and Santa Fe operas to the Rossini Opera Festival at Pesaro. 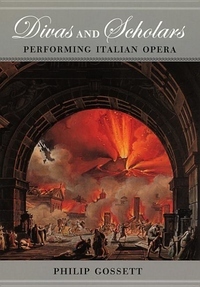 The result is a book that will enthrall both aficionados of Italian opera and newcomers seeking a reliable introduction to it--in all its incomparable grandeur and timeless allure.